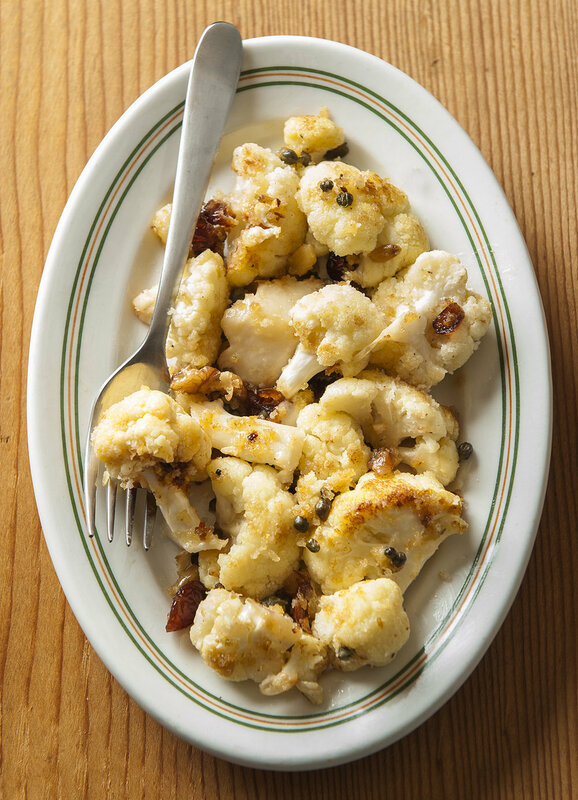 Golden, roasted cauliflower, tossed with salty capers and tangy-sweet craisins, makes a winning side dish or small plate. Toss this with pasta and a little sharp cheese for an easy, light meal. This method of pan roasting works equally well for any member of the cabbage family (broccoli, Brussels sprouts, etc). Just be sure the vegetable is cut into equal sized pieces before you begin for even cooking.. In a large skillet, heat the oil over high and sauté the cauliflower and garlic, tossing until it is nicely coated. Reduce the heat slightly, cover the pan, and cook until just tender, about 5 minutes. Uncover and continue cooking, tossing, until the cauliflower is nicely browned, another 3 to 5 minutes. Toss in the lemon juice, capers, craisins, and walnuts and season with salt and pepper to taste. Serve warm or at room temperature. Roasting pears takes them a step further into their “pearness”. That quick blast of heat caramelizes their natural sugars so they become darker and more robust. Roasted pears will keep in the refrigerator in a covered container for at least three days. Try this combination alongside roast pork or chicken, or serve on dark greens and drizzle with a light vinaigrette. Omit the shallots, they’re great served for dessert spooned over vanilla ice cream or on top of pound cake. Film a medium-sized skillet with the oil and set over medium-high heat. Add the shallots and cook until they’re just translucent, about 3 minutes, remove to a plate and set aside. Add the pears and cook until they just begin to color and turn them carefully with a spatula, about 3 to 5 minutes per side. Set 4 to 6 slices of bruschetta on a plate and layer on the shallots and pears, then top with the crumbled blue cheese. Serve warm or at room temperature. Garnish with the cracked black pepper. *To make the bruschetta: Preheat the oven to 400 degrees F. Set 4 to 6 slices of baguette on a baking sheet and brush lightly with extra virgin olive oil. Bake until the bread is nicely browned, about 5 minutes. Remove. Serves 18 to 24 shot glasses or small cups. Note: This is a colorful respite in the cold winter months, with velvety texture and balanced flavors. From “Chowgirls Killer Party Food: Righteous Bites & Cocktails for Every Season,” by Heidi Andermack and Amy Lynn Brown. “Dishing Up Minnesota: 150 Recipes From the Land of 10,000 Lakes,” by Teresa Marrone. In a large bowl, drizzle the squash pieces with olive oil and toss to coat. Spread the squash pieces in a single layer on parchment-lined baking sheet and roast, turning once, for 1 hour or until the pieces are softened and browned at the edges. Meanwhile, in a medium stock pot set over medium heat, melt the butter. Add the onions and sauté on low heat for 10 minutes, until they have sweated down and moisture has evaporated from the pan. Increase the heat to medium-high, stir the onions frequently and scrape up the caramelization from the bottom of the pan. Once the onions are medium brown, add the garlic and sauté for 2 minutes, stirring frequently. Increase the heat to high and deglaze the pan with white wine and champagne vinegar. Continue to cool for about 5 minutes to reduce the liquid. After the wine and vinegar have almost completely evaporated from the pan, add the roasted squash, broth, salt and cream. Cook on medium-low heat for 10 to 15 minutes or until the squash starts to break down. Transfer the soup to a blender, and blend high until the soup appears creamy and smooth. (Be careful when blending hot liquids!) Press the soup through a strainer. Add the sherry vinegar and salt to taste. In a small saucepan set on medium heat, melt the 3 tablespoons of butter and cook for 1 to 2 minutes, until the solids start to brown. Keep warm. Pour the soup into shot glasses. Top each with ½ teaspoon browned butter and ¼ teaspoon pistachios. Get your pantry in order with this reliable standard for meals that rely on what you have in the kitchen. Chickpeas have a lot of names: garbanzos, Egyptian peas, chana dal, Bengal gram. I call dry chickpeas my go-to winter staple. While there are plenty of good canned chickpeas available in the grocery aisles (the organic brands are especially good), the truth is that chickpeas are so much better when cooked from scratch. Sure, they take longer to soak and simmer than other types of dried beans, but they are well worth the effort. (Technically, chickpeas are neither beans nor peas; they are legumes.) A benefit: When you cook chickpeas from scratch, you end up with a wonderful viscous broth that’s good in soups, stews and sauces. Chickpeas are firm, creamy and satisfying, and they make a fine main dish salad, stew, soup and pasta. Freshly made hummus is the best reason to keep chickpeas on hand. The store-bought stuff in a plastic tub can’t compare to this traditional spread. When puréed with extra-virgin olive oil, lots of garlic, fresh lemon and a pinch of sumac, hummus is one of the easiest party foods to wow guests. Chickpeas and whole grains are natural partners, especially in wintry dishes that are hearty but healthful. Farro, a nutty tasting, slightly chewy and relatively quick-cooking cousin of wheat, works especially well in a main-dish salad with tart cranberries or chopped apricots, and dark greens. Toss these with a bright lemon-spiked vinaigrette and the earthy flavors open up. Most grain and bean salads can be made ahead, held in the refrigerator for a day or two, so the flavors marry. They’re perfect for potlucks and holiday parties. Leftovers make a wonderful lunch. Some cookbooks insist that the chickpea skins be removed, but this seems like too much. When my cupboard is stocked with chickpeas, whole grains, dried fruit, good oil, garlic and spices, I’ve got all I need for a sumptuous meal on those bitter cold nights when I’d rather not have to go out. Note: This makes a nice light main course salad; add sliced chicken or turkey for a heartier meal. It will keep at least two days in the refrigerator so feel free to make it ahead. It travels well. From Beth Dooley. Place the farro, chickpeas, kale and cranberries into a large bowl. In a separate small bowl, whisk together the lemon juice, olive oil and red pepper flakes. Add the parsley, salt and pepper to the chickpeas and farro, and toss all with the vinaigrette. Versatile vegetable makes great side dish or entree. Roasted to a toasty, crispy, deep brown, cauliflower’s starchy crevices turn all caramelized and nutty. This pale white cruciferous vegetable is better suited to roasting than it is to boiling or steaming into a limp, watery mass. When cauliflower is roasted, its subtle sweetness and slightly bitter edge turn robust and the texture becomes meaty. What’s more, roast cauliflower is as delicious served at room temperature as it is sizzling hot from the oven. It makes a terrific side to roast chicken or lamb and is surprisingly perfect with seared scallops and shrimp because they, too, are naturally sweet. But we’ve found that roasted cauliflower is so delicious it can take center plate. I admit that when I’m on my own, the recipe that follows, meant for four, actually yields just one very hearty serving. For a main dish, top roasted cauliflower with crushed nuts or toasted breadcrumbs or sharp cheese and present on polenta, or toss it with dried fruit and a dash of lemon or orange juice and serve on saffron rice. Leftovers, if you have them, are great in a salad with chopped apples or pears and walnuts in a sharp vinaigrette. These days, our farmers markets offer an array of colorful cauliflower with names such as “cheddar,” “orange bouquet,” “graffiti” or “purple cape” (both deep violet) and green (sometimes called “broccoflower”). Because it is a member of the brassica family, cauliflower contains a ton of phytochemicals and antioxidants. But the main selling point is its delicious ease and versatility. So, double this recipe: Two roasted heads are always better than one. Preheat oven to 450 degrees. In a large bowl, toss the florets with the oil and spread out on a baking sheet so they do not touch. Sprinkle with the salt. Roast, rotating the pan halfway through and stirring the florets, so that they are browned all over, about 20 to 25 minutes. Transfer the cauliflower to a platter and drizzle with the orange juice, sprinkle with the zest and the dried cranberries, if using. Serve hot or at room temperature. Diabetic exchanges per serving: 1 vegetable, 1 fat. Try a new (old) vegetable: romanesco (it's the green cauliflower) Is it broccoli? Is it cauliflower? Romanesco, sometimes called "romanesco broccoli" or "broccoflower," is the darling of the brassica family that includes cabbage, kale and cauliflower. While often likened to broccoli, it's not a broccoli, but a hybrid cauliflower. Chartreuse in color, it has a flavor that is a bit milder than cabbage yet more assertive than cauliflower, with subtle yet distinct nutty taste. Its intricate nubby spiral pattern is the perfect example of Fibonacci's mathematical observations of nature. Each of the florets of a romanesco is a smaller version of the larger spine on which it grows. This funky appearance is sure to entice even the pickiest of eaters to go ahead and "take a taste." Right now, farmers markets and produce aisles are stocked with this fascinating vegetable that hails from the Lazio region of Italy and was once enjoyed by ancient Romans. It arrived in the U.S. in the early 1990s, but only recently has become popular enough for farmers to grow for consumer markets. When choosing romanesco, look for vibrant-colored full and heavy heads with firm, solid stems that show no signs of wilting. The leaves attached to the base should be perky and bright. When you bring the romanesco home, place a damp kitchen towel or paper towel over the head and store it in a perforated plastic bag in the refrigerator, stem up. Condensation on the florets causes discoloration and decay. Enjoy this pretty vegetable as you would in any recipe calling for cauliflower. The florets may be broken, then blanched quickly and chilled for use in salads and on the appetizer trays or tossed into stir-fries and sautés. They're fabulous roasted; to do so, simply drizzle the florets with a little oil and sprinkle with salt, spread on a baking sheet and put into a hot oven until they turn a deep caramel brown; serve splashed with fresh lemon juice. A sprinkle of toasted almonds or hazelnuts highlights romanesco's distinctive nutty, earthy flavor. The whole head is so remarkable that I hate to break it up, especially because unlike cauliflower, the romanesco will stay intact and retain its dense texture when cooked whole. To serve, cut the head into wedges, as you might a cake, and finish with a light cream or cheese sauce or seasoned melted butter. The bottom leaves are delicious, so don't cut them off — just trim the stem so that it balances upright. The only trick is not to overcook, because you want the vegetable to retain its shape and not turn to mush when it's cut. Serve it tableside on a bed of rice, barley or wild rice, and pass additional sauce alongside. How many ways are there to cook a turkey? More than you might imagine. In kitchens around the country, the big bird itself is the focal point of discussion. Like autumn's leaves, advice for cooking Thanksgiving's turkey is swirling all over the internet. Is there really a best way to roast this bird? Depends on what matters most to the cook. Fastest? Simplest? Showiest? Here are three very different techniques that all yield terrific turkeys. Yes, you can cook a turkey relatively quickly. But first you need to cut it into parts. That's the approach taken by Joe Zahner, a St. Louis Park chef and senior manager at Sodexo, the Paris-based food-service management company. He demonstrates this in one of his cooking videos, which his son Dominic produces. In "Joe Knows: Turkey," Zahner explains how to cook a 14-pound turkey in less than an hour by cutting the turkey into pieces (legs, breast, wings, etc. ), which he then roasts. "These cuts cook in about the same amount of time," Zahner said. "If you follow the instructions for the stock and the gravy, you've got it all timed to be done at once. This is what chefs do when they're cooking a lot of turkeys for a restaurant's Thanksgiving." On his video, Zahner also shows how to make a richly flavored stock with the back, neck and wing tips that can be roasted ahead of time. He turns the stock into a base for a lush gravy. The upside to this method is tender, moist meat. The downside is there is no intact turkey to carve at the table. But who carves at the table anymore? Find Zahner's turkey technique, and more of his videos, at https://vimeo.com/191670671. Using a very sharp knife, cut up the turkey, separating breast, thigh, wings and legs. If you're making stock for gravy, cut off the wing tips to use and sprinkle them, along with neck and back with salt and pepper and roast until done in a 350-degree oven. Do this in advance of the turkey, if you want to get ahead of the meal. This high-heat method, introduced by food writer Barbara Kafka, blasts the turkey in a very hot oven. This crisps the skin, and drives out excess fat and water so the meat stays juicy and moist. There's no basting, which tends to soften the skin and keep it from crisping; no messy, tricky turning the turkey from side to side or upside down (so the juices run off), and the meat doesn't overcook. It works well for smaller turkeys, 12 to 14 pounds. The method requires a very heavy metal roasting pan. Thin enamel or disposable aluminum roasting pans aren't strong enough to take the heat, and the rendered fat and drippings burn on contact. It also requires a very clean oven or there will be a great deal of smoke. At 500 degrees, the turkey fat tends to spatter so, after about 30 minutes, I reduce the temperature to 400 degrees, which is still plenty hot, but less messy. A 12- to 14-pound turkey cooks in about 1 ½ hours and emerges tender, moist and golden-brown. Before you begin, be sure the oven is very clean. Open the windows as there's often some smoke. Lower the oven rack to the lowest position. Preheat the oven to 500 degrees. Rinse the turkey inside and out, and pat very dry. Sprinkle it inside and out with salt and pepper. Put the turkey, breast side up, in a V-shaped roasting rack set in a roasting pan. Add 1 cup of water or stock to a roasting pan and put the turkey into the oven. After about 30 minutes, reduce the heat to 400 degrees. The turkey is cooked when a thermometer inserted into the thigh reaches 165 degrees, about 1 ¼ to 1 ½ hours. Remove and allow to stand at least 20 minutes before carving. Using this traditional method, the turkey roasts slowly and is basted often. First, though, it's rubbed with a dry brine of salt and seasonings that permeate the meat to keep it moist and infuse it with flavor. This is easier and less messy than a wet brine. The turkey begins roasting with the breast upside down so the underside cooks before it's flipped and basted frequently, to a beautiful finish. A 12- to 14-pound turkey will take about 2 ½ hours to cook, but the results are worth the wait. About 3 to 4 days before roasting, rinse the turkey inside and out and pat dry. For a 12- to 14-pound turkey, mix together ¼ cup salt, a generous pinch of paprika, 1 teaspoon grated orange rind and 2 teaspoons chopped fresh thyme. Rub the seasoning all over the turkey. Place the turkey in a 2 ½-gallon sealable plastic bag, pressing out the air. Put it in the refrigerator for 2 to 3 days. Remove the turkey from the bag, and set it in a pan or on a deep plate and refrigerate overnight, uncovered. Preheat the oven to 450 degrees. Baste the turkey with 2 tablespoons melted butter and set it breast-side down on a V-shaped roasting rack set in a roasting pan; place it in the oven. After 30 minutes of roasting, remove turkey from oven and, using oven mitts or towels to protect your hands, carefully flip the turkey so the breast is facing up. Reduce the heat to 350 degrees. Return the turkey to the oven and roast, basting with the pan juices every 30 minutes or so, until a thermometer inserted into the thigh reads 170 degrees, about 2 ½ hours. Remove the turkey and allow to stand at least 30 minutes before carving. • Rinse the turkey thoroughly and pat dry before roasting. Better yet, set the rinsed, patted turkey on a deep platter or in a pan and refrigerate overnight. This draws out excess moisture so the skin roasts up crisp and crackly. • Bring the turkey to room temperature before roasting to ensure that it cooks evenly. • Always check for doneness by using a meat thermometer. Insert the thermometer into the thickest part of the thigh, but not touching the bone. It should read 165 degrees; the turkey will continue to cook after it's removed from the oven. • Allow the meat to rest at least 30 minutes so that the juices redistribute throughout. Roasted or served up raw in a salad, mini cabbages offer lots of flavor with little fuss. I used to think that the best way to enjoy Brussels sprouts was to roast them to a dark, caramel fare-thee-well. I’d toss them with a little oil and salt, then blast them in a hot oven, so that they’d emerge crisp and sweet, the perfect finger food to pick right off the pan. But the other night, running short on time and long on Brussels sprouts, I decided to shred them quickly and treat them with plenty of good peppery olive oil, lemon juice, a hit of mustard, lots of garlic, shreds of creamy aged Gouda and toasted almonds for crunch. The result was simplicity itself. Fresh and bright tasting, this surprisingly easy, flavor-packed salad was just right with the bowl of hefty chili we served alongside. When shopping for Brussels sprouts, look for bright green heads that are firm and heavy for their size. The leaves should be tightly backed. Avoid those with yellowing leaves or black spots. I prefer the smaller Brussels sprouts because they tend to be milder tasting, while the larger sprouts are more cabbage-like. They’re equally good purchased on or off their stems. Store Brussels sprouts in a bowl or unlidded container in the refrigerator. The outer leaves will wilt a little in the open air, but the inner part of the sprout will remain protected. Plastic bags tend to trap moisture and quicken the sprouts’ demise. To prepare Brussels sprouts, trim off and discard the dry part of the stem at the base as well as any outer leaves. I’m still a fan of roasting Brussels sprouts in a hot oven to drizzle with balsamic vinegar or lemon juice for a side dish or to toss into pasta or scatter on pizza. They’re also terrific shredded and fried in butter for hash to top with a poached egg and bacon or crumbled feta cheese. Brussels sprouts are the darlings of my kitchen — the new kale. Note: Shave the Brussels sprouts very thin for a delicate slaw. This is most easily done in a food processor, but the rough look of hand-slicing with a sharp knife is really nice. This recipe calls for aged Gouda cheese, but a nice Pecorino or Parmesan is delicious as well. To toast the almonds, spread on a baking sheet and toast in a preheated 350-degree oven until just lightly browned, about 3 to 5 minutes. Remove and allow to cool. The salad can be made ahead and will keep in a covered container for a day in the refrigerator. From Beth Dooley. • 1 1/2 lb. Brussels sprouts, discolored or wilted leaves discarded and bottoms trimmed. In a small bowl, whisk together the lemon juice, mustard and garlic, then whisk in the oil in a slow, steady stream. Put the Brussels sprouts into a large bowl and toss in the vinaigrette to coat the leaves. Season to taste with the salt and pepper and the red pepper flakes. Toss in the cheese. Serve garnished with the sliced toasted almonds. Exchanges per serving: 2 vegetable, 2 ½ fat. Be on the lookout for the Beauty Heart, a bright spot among winter vegetables. Beauty Heart radishes won me over the moment the produce guy at the co-op cut into a big one with pale green skin and white shoulders. I’d assumed it was an odd variety of turnip. But inside this radish is a vibrant magenta “heart.” Displayed amid the dowdy parsnips, rutabaga and beets, the cut beauty is fetchingly garish. Rumor has it that this variety of winter radish was originally called “meat radish,” until a marketing-savvy Wisconsin farmer landed on a more appealing name. Winter radishes are bigger than their tiny spring cousins (red cherry bell or the oblong French breakfast) and take much longer to mature. Beauty Heart, like the long white daikon, is harvested in the fall and stored far into winter. Members of the broccoli family, radishes are prized in China for their peppery flavors that cleanse the palate and are often served between courses. They’re a great source of potassium, fiber and vitamin B. The Beauty Heart’s flavor is milder than other radishes — almost sweet. It will perk up an appetizer plate and simple salad. The Beauty Heart is spectacular when thinly sliced and served on open-faced sandwiches of dark rye spread with sweet butter and sprinkled with a little coarse sea salt. Thinly sliced, the Beauty Heart is also wonderful added to stir-fries at the very last minute or floated on top of creamy soups. It’s also mild enough to enjoy on its own as a quick snack. Look for these beauties at winter farmers markets, area co-ops and most grocery stores; but do watch for them because they’re easy to miss. Note: Spectacularly simple and simply spectacular, this recipe is great on a buffet table or served as a first course. Meyer lemons are mild and fragrant, a nice choice for this vinaigrette. Ricotta salata cheese is a salty soft sheep’s cheese. From Beth Dooley. Cut the radish in half horizontally. Using a mandoline or very sharp knife, slice the radish very thin. Arrange the slices on a serving platter or individual plates. In a small bowl, whisk together the lemon juice, oil, salt, pepper and sugar. Drizzle over the radish slices and then sprinkle the cheese overall. Serve immediately. Note: Roasting the Brussels sprouts sweetens and caramelizes their flavor and gives them a toasty, crunchy edge. You can clean and cut the Brussels sprouts a day before, then roast them an hour or two ahead. They are delicious served hot, warm or at room temperature. Be warned that it’s tempting to eat them with your fingers as they come out of the oven, so add a few extra to the pan just for snacking. From Beth Dooley. In a large bowl, toss the Brussels sprouts and the oil. Spread out on a baking sheet so the vegetables don’t touch. Sprinkle liberally with the salt. Roast until the sprouts are dark around the edges, about 20 to 25 minutes, shaking the pan occasionally. Remove the sprouts from the oven and turn into a serving dish. Toss with the lemon zest, lemon juice and pepper flakes and season with salt and pepper to taste. Note: Our local farmers are growing a wider variety of sweet potatoes each year. Some taste brown-sugary sweet, while others have a mild chestnut flavor. Here, cranberries roast along in the pan before they’re tossed with orange and fresh ginger for tang and heat. You can roast these ahead, store in the refrigerator, and reheat them to serve warm or at room temperature. Preheat oven to 400 degrees. Wash the sweet potatoes but do not peel. Cut the potatoes lengthwise in half horizontally. Cut again into 1/2-inch thick slices and then cut into 3 to 4 inch- spears. Brush the pieces with the oil and place on a baking sheet and sprinkle with a little salt and coriander. Scatter the cranberries overall. Roast until the wedges are tender and golden brown, about 25 minutes, turning the spears occasionally with a spatula so they don’t stick. Remove the pan from the oven and sprinkle with the sugar, orange zest and ginger. Return to the oven so that the sugar creates a light glaze, about 3 to 5 minutes. Remove and transfer to a serving dish. Drizzle the orange juice over the sweet potatoes, and season to taste with salt, pepper and red pepper. Note: You can make this entire dish ahead, store it covered in the refrigerator, and reheat it before serving warm or at room temperature. Leftovers are great when simmered with stock then puréed with a little cream for warming soup. I prefer butternut squash for this recipe. It’s the easiest to peel, and its flavor is nutty and sweet. From Beth Dooley. Peel, seed and cut the squash into 2-inch pieces. Turn into a large bowl and toss with the oil. In a small bowl, whisk together the nutmeg, cardamom, cinnamon and red pepper flakes, add to the squash and toss to coat. Spread the squash out on a baking sheet and roast until it’s lightly browned along the edges and tender, about 20 to 25 minutes. Remove and turn onto a serving bowl and drizzle with the fresh lime juice and salt and pepper to taste. Serve garnished with the parsley. Note: To keep the cabbage bright and crunchy, add the vinegar after it’s been lightly cooked. This can be made a day ahead, stored in the refrigerator and then gently reheated before serving warm or at room temperature. From Beth Dooley. In a large deep pot, heat the oil and add the shallots; cook until the shallots are translucent, about 2 to 3 minutes. Add the cabbage, apples and cider, cover, and simmer until the cabbage is just tender, about 5 minutes. Remove the lid and stir in the vinegar, maple syrup, and salt and pepper to taste. In a shallow saucepan heat the oil over low heat and sauté the onion, garlic, ginger, red pepper flakes and ancho chile and cook until the vegetables soften and the mixture becomes very fragrant, about 5 to 8 minutes. Add the remaining ingredients and increase the heat to bring the mixture to a boil. Reduce the heat and continue cooking until most of the liquid has evaporated and the mixture is thick and sticky. It is ready when you can drag a large spoon across the bottom and the mixture stays separated, about 30 to 40 minutes. Discard or compost the spice bag. Spoon the mixture into clean jars, allow to cool before covering and storing in the refrigerator. A little effort and a couple of hours in the oven produce a dish with versatility. My grandmother cooked vegetables until there was no fight left in them, especially broccoli. She served it with plenty of melted butter and a squirt of lemon, and it melted right into the mashed potatoes. So the notion of “tender crisp,” which works fine for carrots, kale, peas and asparagus, never seemed right for broccoli, with its much more aggressive flavor. Inspired by my grandmother’s approach, I’ve come up with another way to cook broccoli that also works well with Brussels sprouts, cauliflower and other crucifers. Most broccoli recipes advise blanching before adding the broccoli to a stir-fry or braise. But really, what’s the point? Broccoli contains enough water that it will steam naturally without additional liquid if sautéed in a little oil or butter to keep it from sticking and then covered for a few minutes before going into the oven. Using this oven method, broccoli can be cooked far past the tender-crisp stage to become meltingly silky in texture, with a deep, rich flavor. It is transformed into a completely different vegetable that works beautifully with sharp, hot, spicy or pungent accents. While the method requires long, slow cooking time, it asks nothing of the cook once it’s set in the oven. The simple technique yields a dish with terrific versatility. It’s great tossed with pasta and a little Parmesan cheese, or served on polenta or grilled bread, or arranged on pizza. It makes a great side dish for grilled or roasted chicken, pork and lamb, a filling for lasagna, a bonus in soup. Roasted broccoli does not freeze well, but will keep nicely for about a week in the refrigerator. But in this kitchen, it’s never lasted that long. Note: This technique also produces delicious results with Brussels sprouts and cauliflower. Feel free to try different flavors after it’s cooked. Try drizzling it with a little balsamic vinegar instead of lemon, or substitute Cheddar cheese for the Parmesan. From Beth Dooley. Preheat the oven to 250 degrees. Cut the florets off the broccoli. Peel the stems and cut them into thick slices, about 1/2-inch thick. Put the olive oil and garlic into a large ovenproof skillet over medium heat. When the garlic starts to sizzle add the broccoli and generous pinch of crushed red pepper flakes. Season the broccoli with a little salt and pepper and stir well. Cover the skillet and place in the oven to cook for about 2 hours, removing to stir once or twice, but trying not to break up the broccoli. It will be very tender when ready. Drizzle the broccoli with lemon juice and season to taste with more salt, pepper and crushed red pepper. Serve warm or at room temperature. Diabetic exchanges per serving: 2 vegetable, 2 fat. Looking for versatility at the dinner table? Reach for a potato! There's a reason potatoes are a standby: They can be used in so many culinary ways. Gotta love potatoes, which are not only comforting, versatile and easy to cook, but also always in season. Well, not really. There is a difference between those just harvested and potatoes stored in the bin for months. Fresh potatoes from nearby farms reflect the quality of the soil in which they are grown, like potatoes from the Driftless Area along the Mississippi River that evoke the mineral essence of its limestone cliffs. Potatoes are the world’s most popular vegetable and the fourth-biggest crop (after wheat, corn and rice). The world of potatoes is defined by the spud’s starch content. Low-starch, high-moisture or waxy potatoes (aka boiling potatoes) are great for gratins and potato salad. These can turn gummy when whipped for mashed potatoes. High-starch potatoes (aka bakers) puff up to be light and fluffy in the oven and when boiled make terrific, airy mashers. Medium-starch potatoes such as Yukon Gold and Yellow Finn and Red Bliss are great in just about any dish. No matter what the variety, new potatoes, about 1½ inches in diameter, are best when cooked quickly and treated delicately. Once blanched, they are wonderful in stir fries, sautés and salads, and can take the place of pasta or rice in any dish. Their natural starches help thicken the sauce and enrich a soup or stew. Potatoes are a natural in curry recipes. They’ll turn a lovely gold, thanks to the spices, provide a neutral balance to the curry’s heat, and make a vegetarian meal more substantial. The potatoes can be cooked ahead and then added just before the dish is served. Unlike more mature potatoes that can be stored in a cool, dark place for several months, new potatoes turn soft and rancid quickly. Enjoy them now before they grow up! Serves 4 as a side dish, 2 as a main dish. Put the potatoes into a large, deep pot with enough water to cover by 2 inches. Set over high heat, bring to a boil, reduce the heat and simmer until the potatoes are just tender, about 8 to 10 minutes. Drain and cool. Slice the potatoes 1 inch thick and set aside. In a large skillet, melt the butter over medium-low heat and add the garlic, onion and jalapeño, and cook until the vegetables have softened, about 5 minutes. Stir in the curry powder, lime juice and water to make a thin sauce. Gently toss in the potatoes, then toss in the spinach. Cover the pan and continue cooking until the potatoes are warmed through and the spinach is just wilted, about 3 to 5 minutes. Season with salt and freshly ground black pepper. Garnish with the yogurt and cilantro, and serve. Diabetic exchanges per serving: 1 vegetable, 1 ½ bread/starch, 1 fat. Ginger and turmeric find a spot in local farms – and local kitchens. Think ginger and turmeric are tropical roots? They’re being grown right here in Minnesota. Unlike the gnarled, tough fibrous rhizomes shipped in from tropical regions, these are mild, fragrant and so much easier to use. Fresh ginger is a beautiful, completely edible plant. Chop the leaves and shoots to simmer into a tea or to flavor a stock. Wrap the leaves around fish for poaching, stuff the shoots into a chicken’s cavity before roasting, chop and toss the leaves into salads and stir-fries. Fresh turmeric, like ginger, does not need to be peeled. Simply chop and toss it into curries, soups, stews and teas. It’s especially delicious with carrots. Its flavor is mildly woodsy and earthy, just a tad bitter, so add it to a dish slowly, adjusting to taste. Happily, for me, whose market basket often overflows with too much great stuff, both these roots are very easy to freeze. Simply rinse them thoroughly to remove the dirt. Gently break the ginger apart to clean the crevices and cut off the stems. Pack and store the clean roots in a zip-top bag in the freezer. To use the frozen roots, remove and grate or chop, then add to the recipe. Both ginger and turmeric are terrific baked into cookies, gingerbread, apple and cranberry pies and cakes. Note: Here’s a fragrant side dish for roast chicken or pork. Toss in cooked shrimp and you have a quick and easy meal. Local fresh ginger and turmeric are available at food co-ops and winter farmers markets. From Beth Dooley. Rinse the rice under cold water until the water runs clear. Heat the oil in a medium saucepan over medium heat and sauté the shallot, ginger and turmeric until fragrant, about 2 minutes. Stir in the rice, salt and 1 1/2 cups water, increase the heat and bring to a boil. Reduce the heat to a simmer, cover and cook until the liquid is absorbed and the grains are soft, about 15 to 20 minutes. Allow the rice to stand for about 2 minutes before tossing in the lime juice, cranberries and sunflower seeds. Sprinkle on the parsley or cilantro right before serving. Diabetic exchanges per serving: 2 bread/starch, 1 ½ other carb, 1 ½ fat.